Last Saturday, I had the pleasure of revisiting a race with longtime running buddy Private Robot. We did our local running club’s Honeywagon Run. The last time we ran this race was in 2013, and I ran the half marathon distance. This year, Robot and I ran the 4 mile together. It was a beautiful sunny race day! Mountain vistas, county roads, the smell of manure in the air… Even though the pack of runners was small, the residents of the town hosting the race sat on their front porches drinking coffee and waving us on. It was such a nice way to kick off the weekend. Our local running club is a dedicated organization, and we are lucky that they put on so many great events during the year. Even though each member volunteers as a condition of membership, several of the running club members put in a TON of time and energy to make these races possible. It’s awesome to run the same races in different years and take note of the growth of the events. Back to Private Robot, I’d just like to take a moment and celebrate her. I am lucky to have such a long term relationship with a good friend AND running buddy. We continue to challenge one another to be spontaneous, ambitious, and balanced in all of the right ways. Private Robot and me in our favorite moment… sweaty and stinky after crossing the finish line. Aww, shucks. Samsies, my little muddy tuchas! It’s all true. 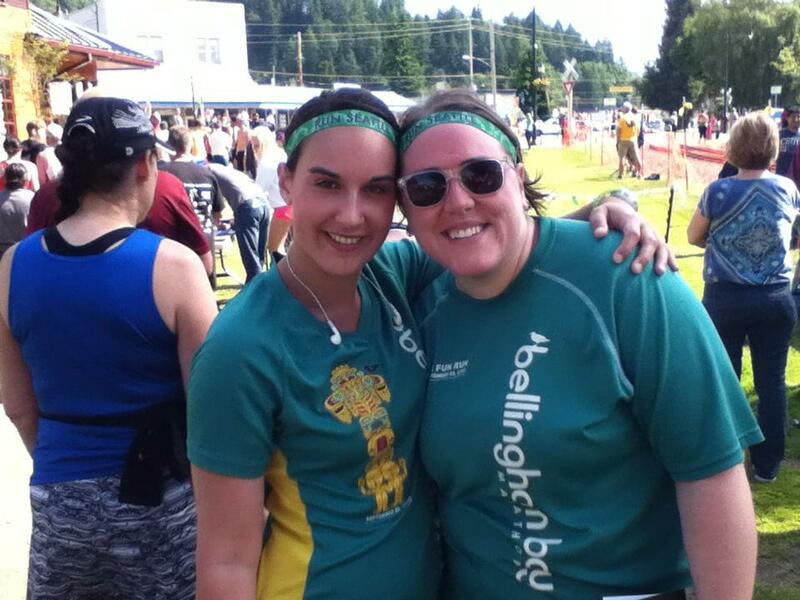 I am also proud of unearthing perhaps the all-time nerdiest picture of us in matching running gear. The internet is forever. Berry Dairy Days 2013? We’re doing it again this year, right? I feel like 2015 is the new 2013. We are working through all the hits.